Case Closed, known as Meitantei Conan (名探偵コナン?, lit. Great Detective Conan, officially translated as Detective Conan) in Japan, is a Japanese detective manga series written and illustrated by Gosho Aoyama. The series is serialized in Shogakukan's Weekly Shōnen Sunday since February 2, 1994, and has been collected in 73 tankōbon volumes as of September 2011. 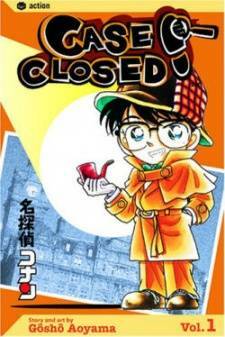 Due to legal considerations with the name Detective Conan, the English language release was renamed Case Closed. The story follows the adventures of Jimmy Kudo, a prodigious young detective who was inadvertently transformed into a child after being poisoned. Since its publication, Case Closed has spawned a substantial media franchise. The manga has been adapted into an ongoing animated television series by Yomiuri Telecasting Corporation and TMS Entertainment; the animated series has reached its twentieth season. The series has spawned three original video animation series, fifteen animated feature films, three live action dramas, one live action series, numerous video games, and many types of Case Closed-related merchandise. A two-hour television special titled Lupin the 3rd vs Detective Conan was aired on March 27, 2009, and featured a crossover with the series Lupin III. 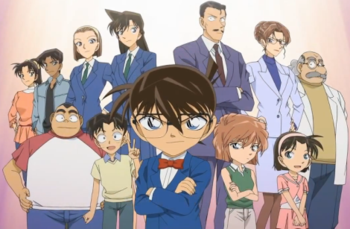 Funimation Entertainment licensed the anime series for North American broadcast in 2003 under the name Case Closed with the characters given Americanized names. The anime premiered on Cartoon Network as part of their Adult Swim programming block and was discontinued due to low ratings. The first six films were released on Region 1 DVD in North America. Viz Media later licensed the manga series for English-language publication in North America and used Funimation's renamed title and cast. As of July 2011, 39 volumes have been published by Viz Media. Compilation volumes of the manga have sold more than 120 million copies in Japan. In 2001, the manga was awarded 46th Shogakukan Manga Award in the shōnen category. The anime adaptation has been well received and ranked in the top twenty in Animage's polls between 1996 and 2001. In the Japanese TV anime ranking, Case Closed often ranked in the top six. Both manga and anime have had positive response from critics for its plot and cases. Great Detective Conan is written in the classic detective genre, with classic layout of the murders in the house, and there are countless cases suspect. Covers the way the case was argued solving very typical of the classic text adventure. Jimmy Kudo is a 17-year-old high school prodigy who frequently helps the police to solve cases. During an investigation, he is attacked by two criminals, codenamed Gin and Vodka, from the syndicate called the Black Organization. They force him to ingest an experimental poison, APTX 4869, which is supposed to kill him, and leave him to die. A rare side-effect of the poison, however, transforms Kudo's body into that of a child instead of killing him. Adopting the pseudonym Conan Edogawa, Kudo hides his identity to investigate the Black Organization. He intends to pretend to be a child until he can find enough evidence to apprehend the syndicate, after which he can then safely find and administer a cure for his current condition. Edogawa enrolls at Teitan elementary school and forms the Junior Detective League with three other children in his class: Amy Yoshida, Mitch Tsuburaya, and George Kojima. To further cover up his activities, he moves in with his childhood friend Rachel Moore, whose father, Richard, works as a private investigator. Kudo continues to solve criminal cases as Conan, but usually poses as Richard Moore with the help of special gadgets invented by his neighbor and friend, Hiroshi Agasa. Shiho Miyano, a member of the Black Organization and creator of APTX 4869, tries to leave the syndicate after her sister's murder, but is held captive by them. She attempts to commit suicide by ingesting APTX 4869; however, like Kudo, she is transformed into a child. She manages to escape and enrolls in Conan's school under the pseudonym, Anita Hailey. She joins the Junior Detective League and assists Conan in his investigations on the Black Organization. Conan's quest has led him to help the FBI to plant a CIA agent, Kir, inside the Black Organization as an undercover spy. In 2007, Aoyama hinted he had the ending planned out but he has no intention of ending the series yet. Scenario: Kogoro, Ran, and Conan miss the boat home after a vacation and accept a ride with the rich Hannigan family on their private ship. Joseph, the head of the Hannigan family, is murdered and the evidence points to Theodore Zimmers who has vengeance as a motive. Theodore's father committed suicide when his company was taken over by the Hannigan family. Theodore is locked in a cabin as he is suspected of the murder. Everyone in the family is interested in the Hannigan inheritance. They are shocked to find out that the will gives the inheritance to Susanna, Joseph's granddaughter. Another Hannigan family member, Shannon, is found dead and Theodore is missing from the storage room.